Today I’m working toward finishing the nine patch I talked about last week. It is going slow only because I am moving slow. I hate cold and cough season! All the large nine patches have been cut in half both directions. Most call this a disappearing nine patch. When I went to set it together, I didn’t like the usual layout for these fabrics. So, after pondering the mess I had created, I took to the internet for inspiration and found a different layout that worked better for the fabrics. 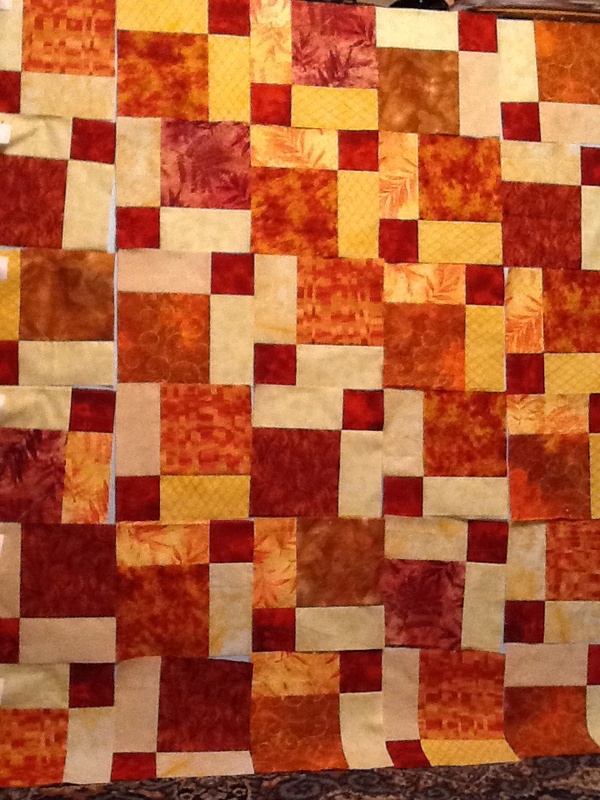 There was a point that I wanted to scrap the whole quilt but as much as I had in it already, I’ve decided to finish it. And this layout works better. 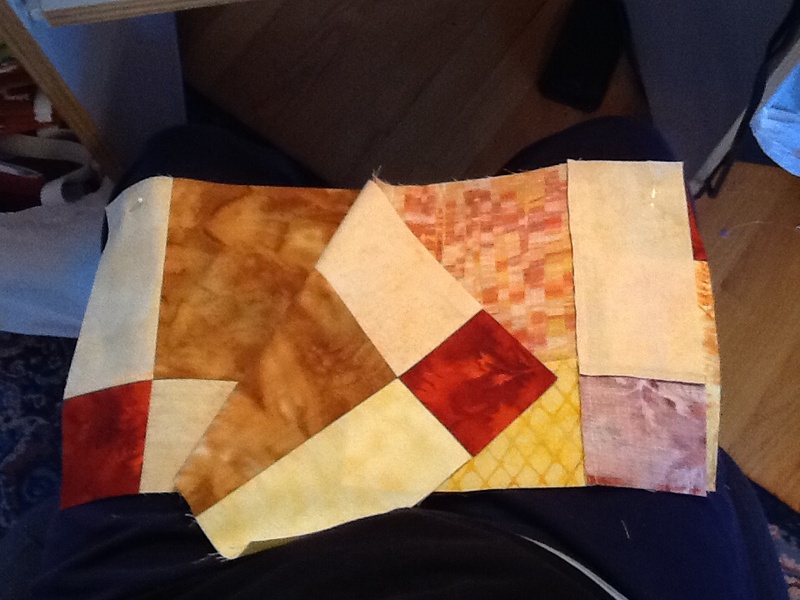 Yep, it is a lot of yellow, orange and gold but with the right thread and quilting it will work. 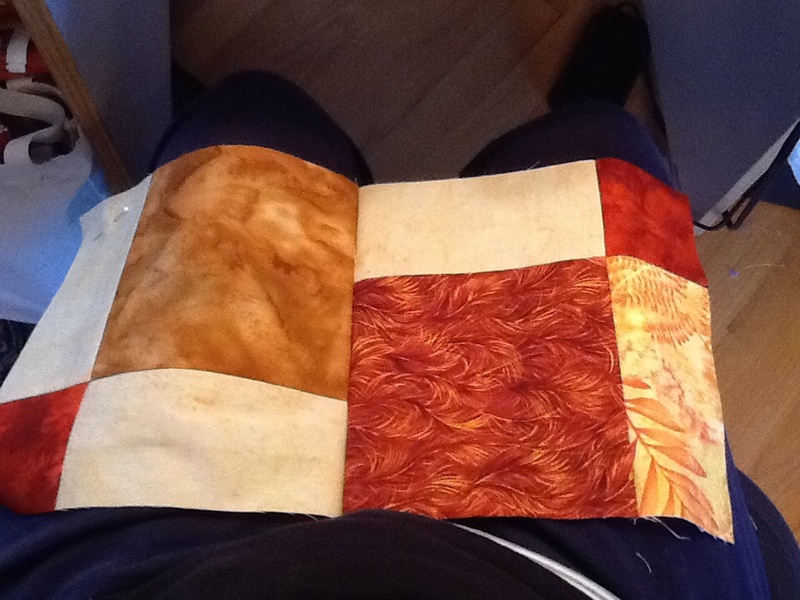 This is a case where a different pattern would have been better for the fabrics, but it will make a great fall quilt! So now, I have 120 blocks to sew together! I’ve picked up the blocks in rows across the quilt and labeled each row. To speed up the process, I will sew the entire row in one sitting at the machine. I put the row number in the top left corner of the block and add the next block in the stack to the right side edge. #1 – “Mark” blocks the same eac time you remove it from your stack when chain piecing. With the third block as the next one in the stack, I put a pin in the top left corner so I don’t turn it the wrong way. I add the next block in the stack to the right side of this block. I continue sewing until I run out of pairs. I leave everything chained together behind my machine. Go to the first sewn pair and cut it from the chain. I open it on my lap with the pin in the top left corner. Cut the next pair from chain pieced line from the back of the machine. Add it the the pair on your lap sewing down the right side. Note the pin showing on the back side of the next pair! 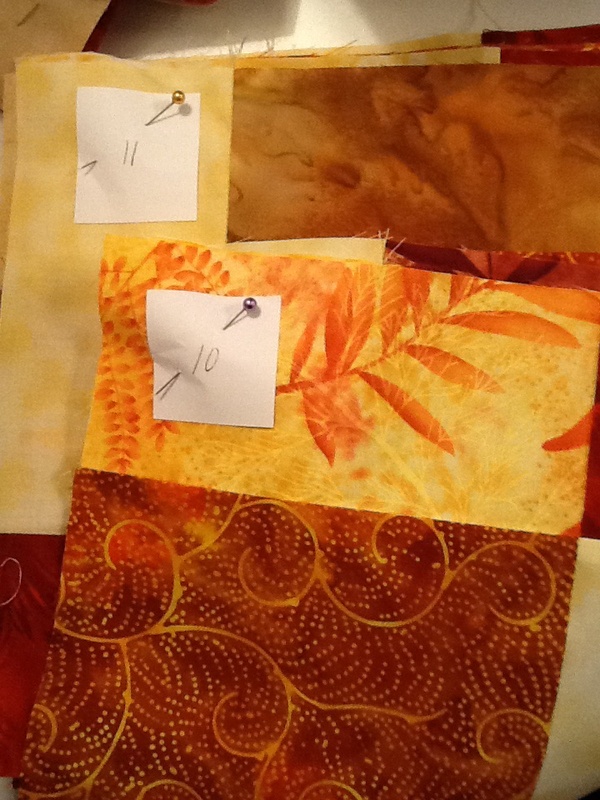 #2 – By keeping everything in line it makes chain piecing much faster! In little time the row is sewn together and I didn’t have to jump up and down to the design wall each time I add a block to the next! May your piecing be quick and easy! This entry was posted in Tips, Uncategorized. Bookmark the permalink.